A cargo vessel has been detained amid concerns its crew were deprived of drinking water and had not been paid. 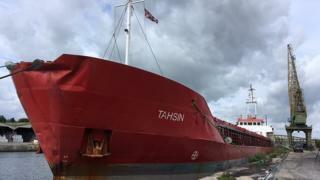 The Panama-registered Tahsin was held at Sharpness Docks in Gloucestershire by the Maritime and Coastguard Agency (MCA) after a complaint was received. Inspectors from the International Transport Workers' Federation (ITF) compared working conditions on board the ship to that of "modern slavery". Voda Shipping, the ship's owner, could not be reached for comment. ITF inspector Darren Proctor said the ship had five Turkish crew members, two Indians and two Georgians, who had not been paid for three months. He said, following a complaint, the ITF inspected the vessel and found evidence of the crew drinking seawater as there was no potable water on the ship for more than 10 days. The crew were also allegedly forced to eat out-of-date food. Image caption The MCA said the boat will remain at Sharpness Docks "for the foreseeable future"
Mr Proctor said: "None of them had been paid for three months, but the Indian crew had not been paid since joining in September and October 2016, and had to pay to even get the jobs. "The master thought it was acceptable to pay the crew every three months and not keep wage accounts." Mr Proctor said following the ITF's intervention, seven crew members have been paid in full and repatriated back to their home countries. He added that the ship's captain remains on board and the cook only recently joined. The MCA confirmed that the boat was detained at Sharpness Docks on 2 June, and said it will remain there "for the foreseeable future". It found 12 deficiencies aboard including damaged navigational equipment and hatchways, which it said will need to be rectified before the ship is released. Gloucestershire Police said it was contacted regarding alleged non-payment of wages and investigated, but said it "believes no crime was committed".